Never Again Canada (NAC), a far-right wing Islamophobic organization, hosts a Facebook page where it incites hatred, with its supporters threatening violence against Palestinian human rights activists at York University, as well as Arabs and Muslims across Canada. NAC has been very critical of a mural at York University showing a Palestinian with rocks behind his back while an Israeli bulldozer demolishes a Palestinian’s olive tree on occupied land. 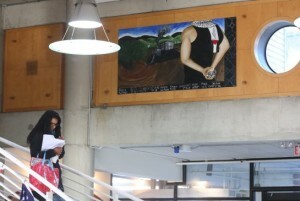 Claiming the mural is “anti-Semitic,” the group is threatening to launch a lawsuit against York University for refusing to take it down. “Using the charge of anti-Semitism is the repeated method used by groups such as Never Again Canada, Friends of the Simon Wiesenthal Center for Holocaust Studies and Hasbara@York to silence legitimate dissent towards Israel’s illegal behaviour,” said Tyler Levitan, spokesperson for IJV. The Facebook page for NAC has over 35,000 “likes” and is quickly growing in popularity. The worst examples of incitement to hatred and threats of violence are documented by the anonymously run tumblr page “Exposing the Racists of Canada”. Independent Jewish Voices Canada (IJV) is a national human rights organization whose mandate is to promote a just resolution to the conflict in Israel and Palestine through the application of international law and respect for the human rights of all parties. There are currently ten chapters of IJV in cities across the country, in addition to a growing number of student chapters on major university campuses. IJV is the only national Jewish organization in Canada endorsing equal rights for both Jewish-Israelis and Palestinians, in addition to supporting the right of Canadians to criticize and challenge the current laws and policies of the State of Israel.